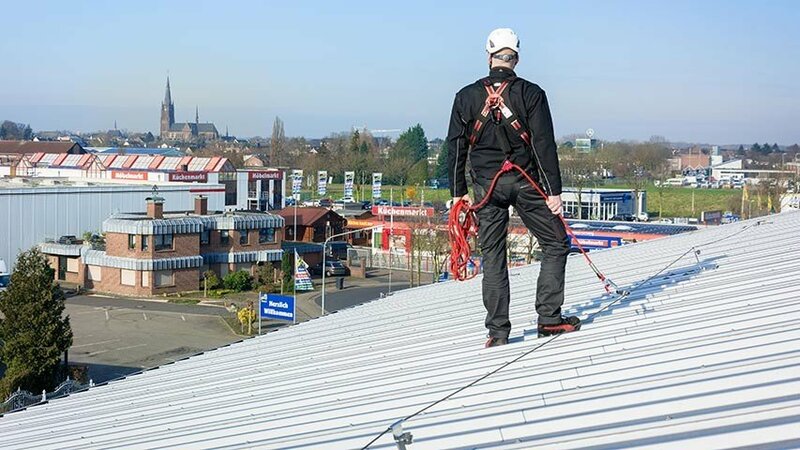 A guided type fall arrester with a flexible anchor line (in accordance with EN 353-2) is a specially-designed connector which can be used by individuals working at heights to protect themselves from falls. Such connectors are used to connect up a user’s safety harness with an anchorage device installed on a building or respective substructure. A guided type fall arrester with a flexible anchor line is a standard component in a personal protective equipment kit (PPE). This type of connector is based on a guide cable (flexible anchor line), a guided type fall arrester, which often doubles up as a manually-adjustable rope shortener, and an energy absorber. This fall arrester is equipped with two carabiners. One is attached to the energy absorber and the other to the end of the guide cable. Fabric lanyard energy absorbers are often used to absorb the force of a fall. In the case of a fall, these stretch to minimise the ensuing force, whereby the amount of stretch is strictly limited. In order to fulfill the requirements of varying working environments, these connectors are available in a range of different lengths. The user connects the carabiner hook attached to the end of the guide cable to the anchorage device and then connects the hook attached to the energy absorber at the other end to the anchorage eyelet of his/her safety harness. The respective anchorage device may be a single anchorage point for individuals, a roof safety hook or a glider attached to a lifeline or rail safety system. Whilst working, the rope shortener is used to keep the guide cable adjusted to the safest length. Ideally, the connector is adjusted so that the user cannot step out over the falling edge. This prevents the user from falling. When used in a vertical lifeline system, the guided type fall arrester is not equipped with a manually-adjustable rope shortener. Instead, the guided type fall arrester glides along the guide cable on its own and follows the user’s movements. If a sudden load is exerted upon the device - in the case of a fall, for example - the device automatically blocks to arrest the fall. According to the DGUV specifications, guided type fall arresters which are part of a personal fall protection kit must be regularly inspected by a PPE specialist and serviced where required. Irrespective of these regulations, a maximum usage period has been stipulated. Once this period has lapsed, these connectors may no longer be deployed - regardless of their condition - and then need to be replaced.